3/4 cup rice – any type except glutinious rice-e.g jasmine rice, Australian medium grain rice. wash all the grains together, discard rinse water. add enough fresh water to cover the grains. add curry leaves and dry chillies. allow to soak for a min of 1/2 hour and max of 4-5 hours. grind the grains, curry leaves and chillies to form a fairly uniform batter that has a smooth dropping consistency. do not add too much water. if required to get the correct texture, water can be added later. mix in hing and salt. heat a flat based griddle pan [ tava]. test the heat by sprinkling water on the surface. It should splutter immediately. smear the pan lightly with oil or ghee. using a small ladle, spoon the batter on to the middle of the pan. using back of the ladle, spread the batter lightly, to form a disc of approximately 2-3 mm thick. when the surface of the adai starts to turn opaque, drizzle oil around the edge and a little over the centre. when the edges turn a light brown colour, slide a spatula under the adai and turn it over to cook the top surface. when this surface turns a light brown colour- light crust will form. remove from heat. Keep the adai warm but avoid covering as you cook the batch. Texture: surfaces should be lightly crisp with a cooked but soft centre. Service: serve as a light meal, hot or warm. can be reheated on a hot skillet. Avoid covering hot adai- it will sweat and loose its texture and may become soggy. 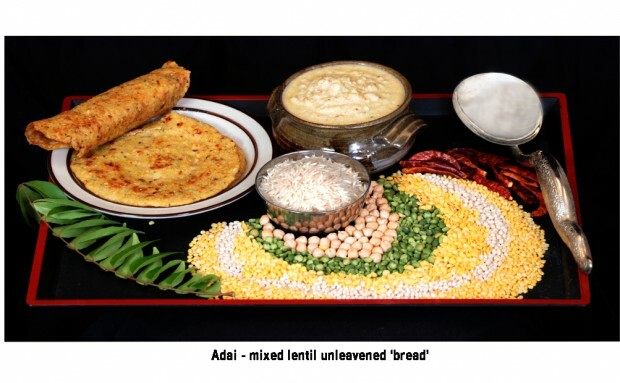 Storage: make the adai fresh but batter can be stored for 4-5 days in the fridge. slight sourness to the batter will make the adai ‘fluffy’. Discard very sour batter. Hints: any combination of beans and lentils can be used but it is important to use the same measuring implement for all the ingredients. The proportion of latter must always approximate the volume of Rice + Urud dhal.